Mum is the word, the word that you heard | Yobot Inc. Here is our beautiful orange mum, planted by the previous owners right smack in front of our house. 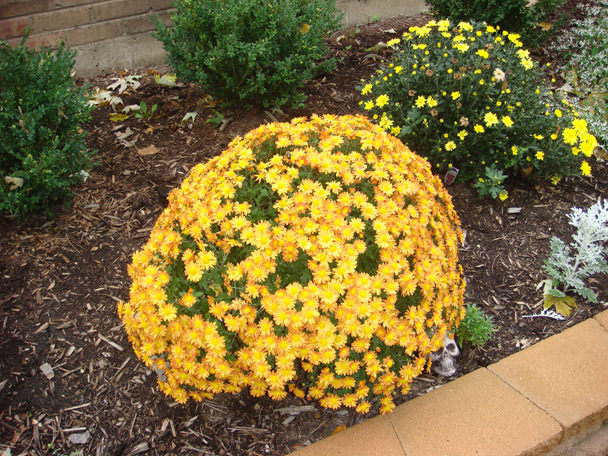 Notice my scary Halloween skull peeking out from underneath the mum. If that’s not scary, I don’t know what is. Robert is home from the east coast and now we both are infected with Baseball Fever. Tonight is the first game of the World Series, and to celebrate, we’re having hot dogs with east coast buns that Robert brought back with him on the airplane. And peanuts, and cracker jack, while wearing our Red Sox t-shirts and talking like we’re from Baaaaaahston. Tasty and Fun!